The history of Bhopal has always fascinated me. It is unique among states in India, as the only state ruled by a succession of four female monarchs—that too in purdah. These monarchs were able to bring prosperity to their state with modern developments that they initiated. Thisincluded an efficient postal system, railways and a modern system of waterworks. Being pragmatic rulers, the Begums negotiated and maintained good relations with the British, who in turn treated them with respect. Bhopal in fact remained a calm and peaceful state, till it hit world headlines after the unfortunate gas tragedy. The portrait of the last ruling Begum, may be seen at the entrance of Noor-us–Sabah, the royal palace. Also seen here is a royal palanquin in which she moved around the city, while displayed opposite are the state’s royal standards that preceded the royal palanquin at state functions. The maternal grandmother of Nawab ‘Tiger’ Pataudi, the Begum was a descendent of Afghan Chief Dost Mohammed Khan. Khan was in charge of Bhopal during Aurangzeb’s reign and took over the state, after the Mughal monarch’s death in 1707. The old city was built by him, and ruled by his descendents till India’s independence. The beginnings of this city date back a great many years. Bhopal is said to have been founded in the 11th century by Raja Bhoja, who is also credited with building the two beautiful lakes that can be seen in the city. Thereafter, succeeding invaders devastated the region till it was finally rebuilt in the 18th century by Dost Muhammad. Named after its founder, Raja Bhoja, Bhopal was earlier known as Bhojpur and his legacy is the huge Bhojeshwar Temple some distance from the city, which he left incomplete. Bhopal is where old and new co-exist in perfect harmony. It is apparent that the upkeep of old monuments and buildings has not been high on the list of priorities, and some really beautiful structures are crumbling. But Bhopal is spread over seven hills has a splendid beach road, circling the lakes—a major attraction of this charming city. The Taj-ul-Masjid, one of Bhopal’s more recent monuments was begun under Shah Jahan Begum, who ruled from 1868 to 1901, but was completed by her successor in the 1970s. Other important mosques include the Jama Masjid built in 1837 and the Moti Masjid in 1860. The chowk area of the old city is full of gracious old homes with their distinctive architecture, havelis in narrow lanes, large mosques and shops—stocked with the craft of the region—beadwork, embroidered and sequined handbags and silver jewellery. Not included on a tourist’s itinerary is Bhopal’s Taj Mahal—a splendid complex of palaces with a central garden courtyard and covered walkways. Now in ruins, the entrance to the complex is difficult with the ceiling having collapsed. With the potential of becoming a major tourist attraction, one wonders why it should have been allowed to deteriorate to this state. Earlier known as the Raj Mahal, it was renamed ‘Taj Mahal’, on a suggestion by the Viceroy of India to the ruling monarch Shah Jahan Begum, prior to the visit of the Prince of Wales. The name seems well-deserved, as vestiges of its former glory are clearly discernable. A unique art centre is the Bharat Bhawan, designed by eminent Indian architect, Charles Correa. Within its sprawling premises, art activities of all varieties get a focus, with artists and theatre people constantly visiting the venue. It has a fine collection of contemporary Indian art, where major works by most of India’s leading artists find a representation. For art lovers, a visit is really worthwhile, as many of the paintings and sculptures have seldom been exhibited outside the Bhopal, or even in print. The museum of folk art is also a splendid repositary of the rich folk art traditions of Madhya Pradesh. Also famous is the repertory theatre of Bharat Bhawan, where shows are held at the in-house auditorium, on most evenings. Bhopal is also a splendid base for many interesting excursions. The main palace of Dost Muhammad Khan just 11 km away at Islamnagar, is well worth a visit, for its inspired combination of Islamic and Hindu architectural features. Within the palace complex, the Chaman Mahal and the two-storeyed Rani Mahal deserve special mention. 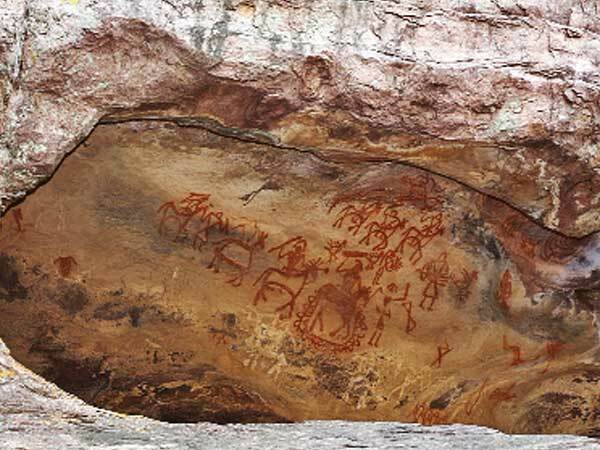 Bhimbetka, located 45 km south of Bhopal, has approximately 500 caves, discovered fairly recently, where the most amazing rock paintings may be seen. Some of these date as far back as 12,000 years, and some seem to have been painted over, indicating that these caves were used by succeeding generations. The colours of the paintings are remarkably well preserved, with depictions of wild buffalo, rhinos, bears and tigers. On the road to Bhimbetka, a short diversion takes you to Bhojpur. Here located on a rocky mound, is Raja Bhoj’s massive Bhojeshwar Temple, designed in massive proportions with steep stairs. The temple is said to have never been completed, and the ancient scaffolding used for lifting the stones may still be seen. Also side by side is the new scaffolding, for an effort to restore and complete the temple. Incomplete as it is, it still attracts a large number of pilgrims, who come to pray at the Shivling installed within. Forty-six km northeast of Bhopal lies Sanchi, and in fact trains from Delhi, stop at Sanchi station before going on to Bhopal. This site of the Great Stupa, considered to be India’s oldest stone structure, has a majestic dome built over Buddhist relics, surrounded by an intricately carved railing, with four ornate gateways. Besides the main stupa, there are a number of prayer halls, with distinct Greco-Roman influences. There are also a number of monastries, smaller votive stupas and innumerable other ruins including foundations and pillars of residences or temples, as well as a water tank, and a large begging bowl carved out of a single rock. From Sanchi a short drive takes one to Udaigiri, a rocky hillock, where a number of caves have been carved out of rocks. Here there are some fine images of Vishnu, Durga, Ganesha, and an unusual Shivling with Shiva’s image carved on it. During the Mauryan rule, Vidisha was an important town and Emperor Ashoka’s wife is said to have hailed from there. Located close to Sanchi Vidisha may have been the location of the Mauryan Court. There is much to see at Bhopal, and one needs to spend at least three days to see it all. Do remember to include a play at the Repertory Theatre Group at the Bhopal Art Centre, and spend some time in the art gallery where hidden away from public eye, lie some unique works by India’s best-known artists.